Rebecca Goodine was playing a video game when something clicked. It was BioShock, a first-person shooter game, and she was presented with a choice: hurt an innocent for personal gain, or help a stranger for a personal loss. 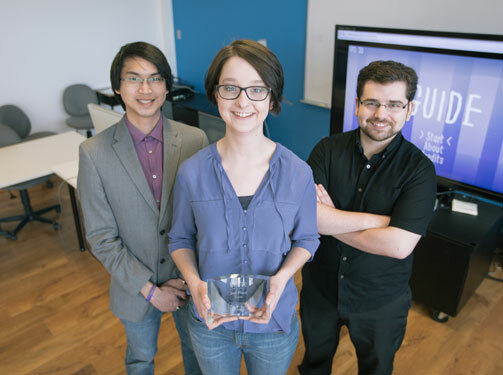 Ms. Goodine is part of a trio of UNB students who recently placed second and took home a $2500 prize in the international student game development competition, Games4Health. Hosted by the University of Utah’s Sorenson Centre for Discovery and Innovation, the competition encourages students to design a game that engages people to live healthier lives. Ms. Goodine and teammates Elliot Coy, a computer science student, and Jade Yhap, a psychology student, came second in the empathy category, which was co-sponsored by game developers iThrive. They were tasked with creating a game that fostered empathy in teens. Ms. Goodine, Mr. Coy and Mr. Yhap chose to focus on social anxiety, a topic that had touched all of their lives at some point either directly or indirectly. Guide begins with a fairly simple story premise. The player’s character is a bird, “Fia,” who wakes up alone and vulnerable in a forest. Fia soon meets a guide who says it can lead them safely through the forest. The use of a guide is a well-known video game trope, familiar from such classic games as the Legend of Zelda. But in this instance, it becomes apparent that the guide’s advice to not trust the other animals in the forest has been a lie. Using video games as a tool to build skills like empathy is a growing field. Nathan Thompson is a PhD candidate in sociology at UNB who has worked with a group of six youth and independent video game developer Chad Comeau to create a game exploring LGBTQ+ identities. The game is called fade and it features a variety of situations that someone on the LGBTQ+ spectrum may encounter on a daily basis. Mr. Thompson’s team presented fade at the Different Games conference in New York last month. Nadine Violette, UNB Renaissance College student, is one of the students that worked with Mr. Thompson on the development of fade and attending the conference just days before the game was released to the public. According to Ms. Goodine, the medium of the video game allows the designer to reach people in different ways than if they were watching a movie, for example. Ms. Goodine plans to continue to probe these questions when she heads to the Zurich University of the Arts in Switzerland this September, on a scholarship to study empathy in indie games. While there, she’ll also study Zurich’s game research lab to see how its model could further advance the general game studies research currently happening at UNB. Mr. Thompson’s team is proud to see how their efforts came together to form the final product. Fade can be played online the player takes turns playing two different characters, each of whom experience their day in slightly different ways. The game includes some unexpected revelations, some touching but emotionally challenging moments, and playful and interactive dialogue and characters.